I have decided to post about my new project I'm working now. Maybe it will help me to get some advises and to avoid some mistakes. 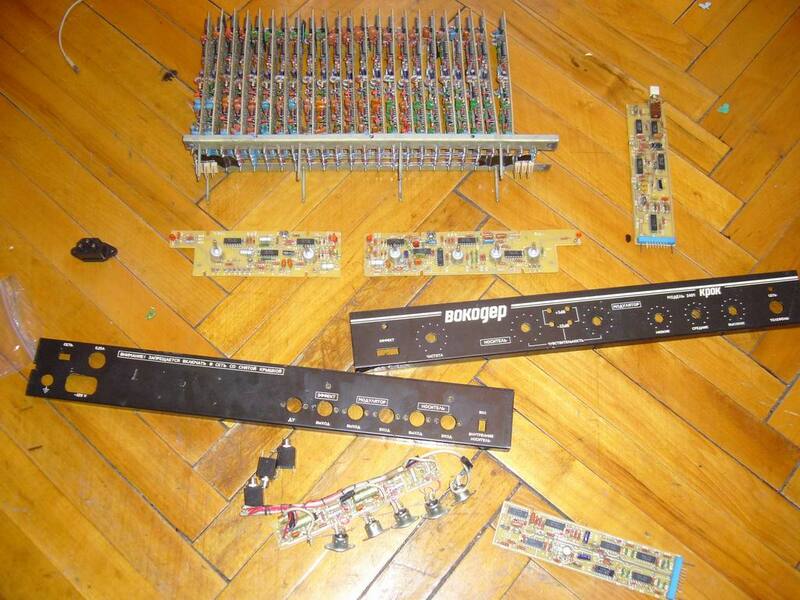 I have written somewhere on the forum I repaired 1988 soviet 24 band vocoder. Now I made one channel based on its schematic but with changes. It works, but very hard to understand how it sounds because I have only one channel now. My channel sounds different than soviet analog, I think better but will can say exactly when will make all filterbank. I replaced crappy old soviet single opmaps with TL074, and replaced transistor pairs VCA with THAT2180 VCA. Anyway DIP trans pairs cost equal to 2180 IC. The channel has turned out much more compact. I already drew in Eagle filterbank board. 6 channels fit on the eurocard (160x100). So will be 5 boards - 4 for filterbank and one for in-out circuits and controls. I made CV in and out pads on board for every channel, so if someone wants can make patch matrix. In-outs circuits I plan completely remake. I think about THAT based mic amp, then (maybe) one knob limiter (THAT), then simply output summing amp (OPA2604) and 4-band EQ. maybe switches to bypass limiter and EQ, and maybe limiters makeup gain pot. I like these pots from Smallbear. They are 15 mm - not small as 9 mm and not big as regular 16 mm (they are already sick), and have possibility to mount funny LEDs. I think module deep will not exceed max for Doepfer case 14 sm. 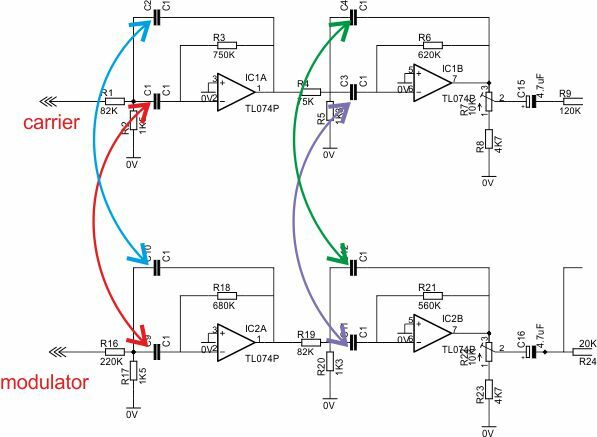 It can work from 12 and 15 V with minor changes - some resistors values. I will order next week filterbank prototype boards, they will be ready in one week. Will inform about progress. Please write your comments. Not needed to write who are in, the project is still in its infancy and no one knows what will happen as a result of. Я ТВОЙ РОБОТ. Я ТВОЙ РАБОТНИК. I don't have anything to add besides the fact that I really want to see this happen! I was just researching vocoders yesterday. Nearest idea I had was picking up one of the many sub $200 pedal vocoders and converting it so it lived behind a eurorack panel. This project sounds WAY more serious. I'll be following along, and will be tempted as long s it's not crazy complex (is that really 4 stacked PCB's). It's not crazy complex. All 24 channels are identical except for the caps values. Some trimming required - 3 trimpots for every channel to set levels. And no 4 but 5 boards, one for controls and in-out circuits. The project will be quite expensive. I think build cost will be about 500$. Therefore I plan to release first limited quantity, maybe 10 sets. This is original one. 5 channels don't work and can't trimm properly because old rusty trimpots. It is very rare - not more as 100 were produced in 1988, and not many survived until today. My has 25 serial. "Hier spricht die Stimme der Energie"
Don't forget a filter stack can be used to implement a Barber Pole filter. Cool, so If I am getting this correct it will be a 24 band unit (4 cards with 6 bands on each one) and it will fit in euro! SWEET! Well the Sound clip is great, can't wait to see this one come together. Great demo! That sounds fantastic! This is really impressive, nice work. I'd be interested, but I couldn't lay out $500 all at once. I had been thinking recently how the Korg VC10 would make a great DIY Vocoder. It sounds great, and had 22 bands + envs all on one medium-large sized PCB, with preamps, compander, and divide down synth on a second PCB. There was a salvaged filter PCB on ebay not long ago, but I lost the bid. It went for only $75. I wouldn't be super surprised if this soviet design was derivative of the Korg. PS-- are you still planning to offer you VC Compressor PCB? I was getting interested in that one also. This is not mine yet. This is sound of vintage soviet vocoder which is the base for mine. As I written above 5 channels don't work and can't trimm properly because old rusty trimpots. And I completely removed in and out circuits, so it connected direct to my gear. Compressors PCBs are still in producing. I hope will receive next week. The company makes PCBs within a month, its time is running out soon. if the user adds a "Shepard controller"
I made pads on PCB - CV out from modulator and CV in to carriers VCA for each filter. Can't imagine what I can do more. When you say "release" this, do you mean the 5-PCB set? Filters are similar (first two opamps and associated parts) but not identical. The rest of the circuits are different. I think those caps should be matched in pairs for better results. How do you think? They all have identical values. There was a salvaged filter PCB on ebay not long ago, but I lost the bid. It went for only $75. I think my PCBs set will be double that price..
Looks interesting and on a good track. Eventually you'd want to look into voiced/invoiced, but you don't need that to get the vocoder bands all working. Also, while I know you are improving the specs on the Soviet original its worth finding out what the good ones did right. As for other comments -- $200 pedals? what's analog in that range and in a pedal?? As for the Doepfer Shepard Module. Please fill me in on a Shepard filter?? I have that module. I thought since there's a micro controller inside it had 2 separate modes. The Shepard generator did like 15 LFOs from a master tempo that are all triangles and ramps with different phases. You'd use some of them with gear that has a VC frequency like multiple phasers or VCOs though nothing stops you from opening and closing a vocoder decoder for a sort of smooth fixed bandpass cross fading. Can't do a Shepard effect with a vocoder decoder since you can only open and close fixed bands though you can do a Moogerfooger murf fx. The other Doepfer mode is Midi CC to 0-5v in 15 or whatever channels. So you could connect that and MIDI each band to open and close. The mp3 you posted of the soviet vocoder sounds so good! Please don't make your version too clean and soulless - it's the raw gritty sound that's appealing! As for the Doepfer Shepard Module. Please fill me in on a Shepard filter?? If each filter of the vocoder had a separate input for freq modulation then you could use the Shepard generator to modulate them and create the psychoacoustic illusion called "the barberpole effect"
The easiest way to look at a Shepard generator is to consider a Quadrature LFO, which has four identical waveforms out of phase by 1/4 of the period. An (8 stage) Shepard generator would have 8 identical waveforms, each out of phase by an equal amount; 1/8 of the normal period. If the Shepard generator is creating upward saw waveforms each filter it modulates would sound like its being swept up, and the frequency we hear would sound like going up in pitch. Once you start overlapping that effect with 8 filters your brain cant tell when one filter is reaching the peak of its sweep, and when another filter is starting its sweep, it all blurrs and we actually think the sound is continuously going up in pitch when the source Audio is really staying constant. If the Shepard generator was modulating the filterbank with a downwards saw waveform, the output would sound like its getting lower and lower. Not everyone can get hold of a A-191, and I realise a Jack on the front panel for every filter would waste a huge amount of space, but if the L-1 vocoder has input (headers) for each filter's critical frequency on the boards, then an expansion board could be released later to add the option between traditional vocoder and Shepard Filter Bank (the first in Euro I believe, There's an old Buchla version). My only real experience with Vocoders is with the one on the Nord Modular. The most fun was the re-patching of the spectrum to different filters from the original ones. Reversing the spectrum so low frequencies in the control would open high frequencies in the program. That is where the fun really is. The EMS Vocoder had the best setup for this with a patch matrix to link the CV outs of the carrier filter banks to the CV ins of the VCAs in the program banks. You could run multiple program filters with single carrier bands ad things like that - super versatile. I would suggest bringing all the carrier and program CV lines out to easily reachable headers and then all sorts of external add on boards and patch panels cant be connected easily. I'd love one of these..
$150 will get you an iron lung. No idea if it's analog I don't think I claimed it was, I wasn't even really equating it to this project, just a passing comment that that was one approach I was considering. no freq modulation here. VCAs control amplitude of each band. The most fun was the re-patching of the spectrum to different filters from the original ones. it's possible if you will make some patch matrix. 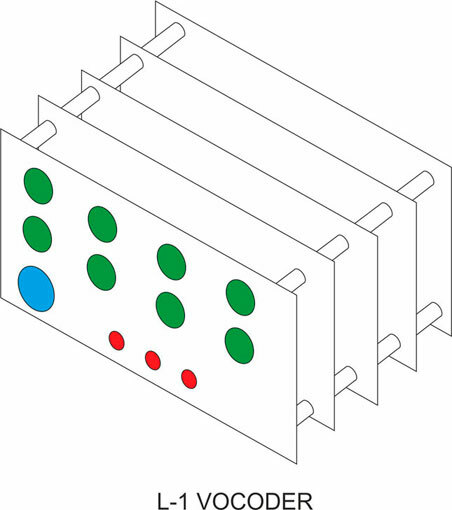 As I already written, I left pads for CV connectors, you will need only to cut the trace between and connect to matrix. My Vocoder experience is all with the Bode, and I have the same attitude as you. The fun comes from repatching. Patch them up an octave or two and you get Mickey Mouse. Down an octave or two and you get Darth Vader. Mix them up and you get confusion (in a good way). love the repatching on the nord too, inverting is fun.